Every now and then you get to do something with the job that is just plain fun. That's the way it was when we headed to ESPN Headquarters in Bristol CT to produce a special demonstration of the STIHL® TIMBERSPORTS® Series. The event is part of our 25th anniversary celebration and ESPN invited STIHL to bring a demonstration to their campus to give their employees a chance to interact with their second longest running program. 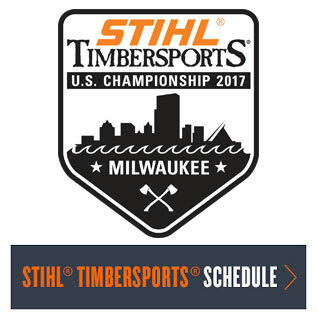 Joining us were STIHL® TIMBERSPORTS® athletes Mike Sullivan, Dave Jewett, Will Roberts, Nathan Waterfield, Katie Rick and Shana Martin. The goal was to give the ESPN folks a taste of all the disciplines featured in the show. ESPN rolled out the welcome mat, flying our flag center of campus and publicizing the event with signs and intra-office emails. Our first guest was the team of the Mike & Mike morning show. Mike Golic and Mike Green watched the demonstrations, provided commentary on the skill of the athletes, and then got in to the action taking on the speed climb and log roll. Both commentators had a great time getting involved in the events, and walked away with a new found respect for the competitors in the sport. Our film crews were on site and clips can be seen at stihltimbersports.us or our Facebook page. We will also be incorporating elements of this event in to our show that will air in September. In the afternoon we set up demos and interactive event for the ESPN staff. STIHL® TIMBERSPORTS® Competitors demonstrated their skills across the eight disciplines while taking questions from the crowd about their equipment, training regimen, and the development of the sport over the years. We later opened up the venue to the large crowd of ESPN staff to attempt the different disciplines for themselves while learning more about the techniques of the sport. Sportcenter.com staff joined us as well and took on the log roll challenge. We want to thank everyone who helped make this event possible including our production teams of Granite State Lumberjack Shows, Lumberjack Sports International and JM Associates. And of course our sincere thanks to our great hosts at ESPN.